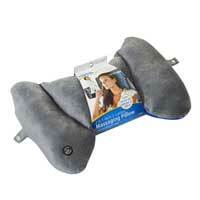 Our Deluxe Microbead Pillow is the choice of Frequent Travelers everywhere! Filled with thousands of ultra-fine polystyrene beads to cradle your head and neck in your most comfortable position. The outer shell is half spandex and half micro plush. Arrive at your destination refreshed and relaxed!